We've been having a heat wave, here in South Australia over the past week, so last night we decided to take Felix, and one of our dogs, to the beach to cool down a bit. Felix was excited, even just getting his bathers on. He loves the beach, and last night was no exception. Gone are the days of Felix sitting in one spot on the sand, or paddling his toes at the edge of the water. 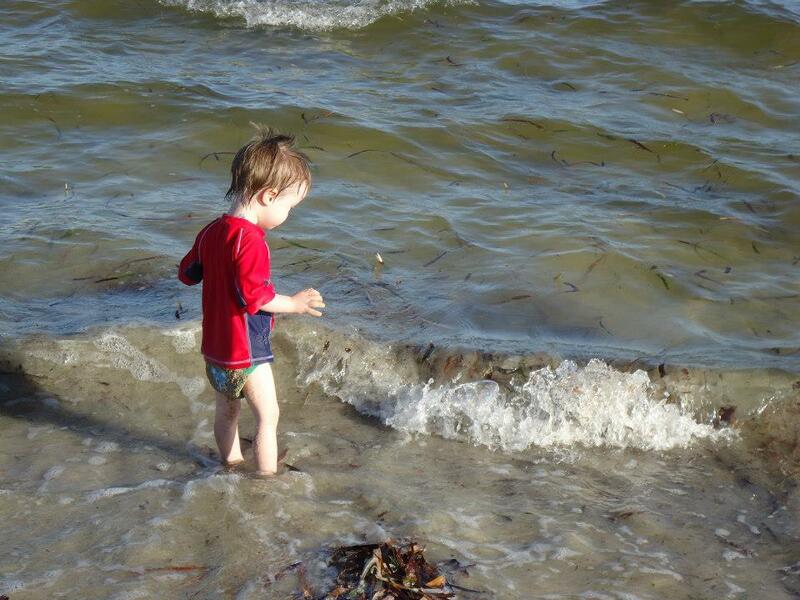 As of last night, he just wants to keep walking out into the water; the deeper, the better! As soon as we got to the beach, he walked to the edge of the water, and just kept going. 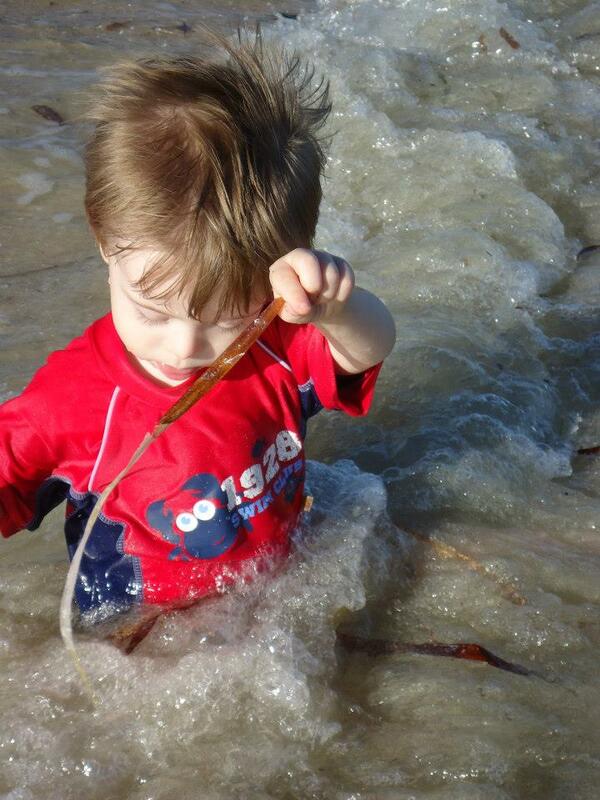 He had little waves splashing him in the face, but was not bothered at all. Every time I tried to turn him around to lead him back to where it was more shallow, he got cranky with me and pushed my arm away. He was quite confident in his abilities, but I knew that at any second, he was going to try and sit down and the water would be way over his head (I'm a little bit paranoid about him getting another ear infection so I didn't want that to happen). He maintained his balance, even with the waves trying to topple him over. I was very impressed. After a while, I convinced Felix to come and play in the sand for a while. He didn't want to just sit, though. He wanted to go for a bit of an adventure. He walked up the beach, over different surfaces; hard sand and soft, and piles of deep seaweed. It was great to see him navigating so many obstacles, without once tripping or falling over. He has become a lot stronger in his legs, through climbing and balancing on things at Kindergym, and at home. I think he has become a lot more aware of his surroundings too; knowing when he has to be careful and slow down, and when he can just rush. 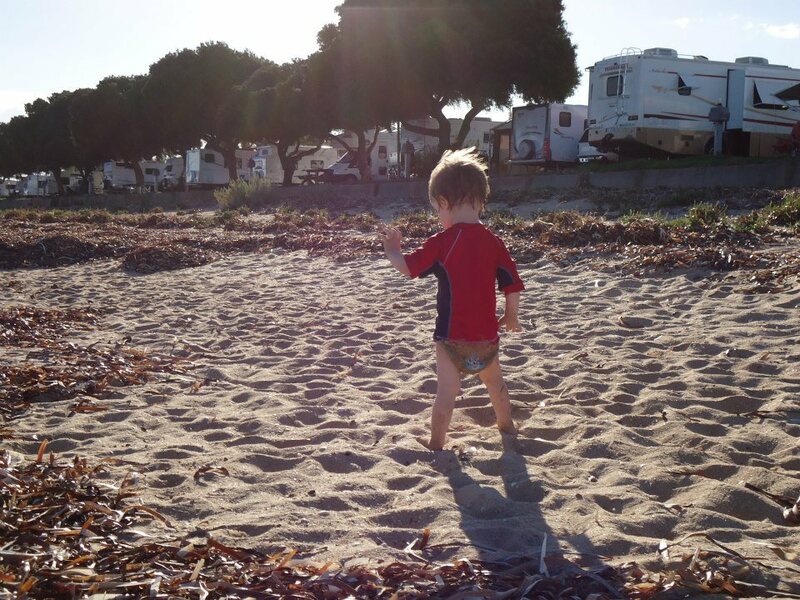 The beach is a perfect place for him to practice all the new skills he has learnt, and it's a bonus for us to be able to see him enjoying himself so much. By the time Felix had finished playing on the sand, he was covered in it, head to toe. He headed back to the water again, so I decided to go for a dip and take him out deeper, with me, to give him a good rinse off. He absolutely loved it. He couldn't stop giggling. He hasn't been to swimming lessons for ages, because of all the trouble with his ears, but he quickly remembered how to kick his legs. His favourite thing was when we were jumping over the little waves with a 1,2,3. It wasn't until the very end when I missed a wave (they were only tiny), and it splashed him in the side of his head and water got in his ear. Next time I'll have to remember to take his headband and earplugs with us. I worry about his ears, because he's had so many infections, but he gets them even when we don't take him in the water, so I'm not sure it makes that much difference.